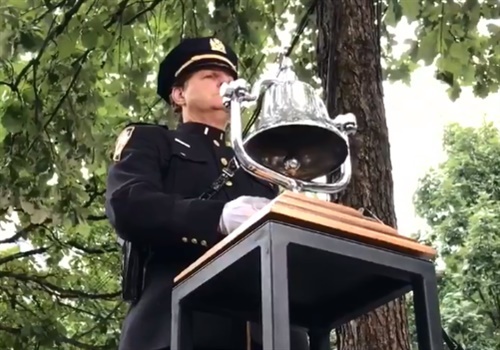 he NYPD paid tribute to those first responders with a series of Twitter posts—one for each NYPD officer and several others paying tribute to the FDNY and PAPD, as well as for those who died at the Pentagon and in Shanksville (PA) on Flight 93. Image courtesy of NYPD / Twitter. On September 11, 2001, 23 police officers with the New York City Police Department, 343 firefighters with the New York City Fire Department, and 37 police officers of the Port Authority of New York and New Jersey Police Department perished when the Twin Towers collapsed. Today, the NYPD paid tribute to those first responders with a series of Twitter posts—one for each NYPD officer and several others paying tribute to the FDNY and PAPD, as well as for those who died at the Pentagon and in Shanksville (PA) on Flight 93. "Join us as we take a moment of silence at the @Sept11Memorial and at every NYPD facility to honor the lives lost on 9/11 & for all those who continue to suffer due to related illnesses," the department said in a Tweet. The department added the hashtag: #NeverForget. "Because of the actions of the 40 passengers & @United crew of Flight 93, the attack on the U.S. Capitol was thwarted," one Tweet read. "We will #NeverForget those lost on 9/11 at the Pentagon," another Tweet read. For each fallen NYPD officer, a single, simple Tweet that includes the officer's name, a photo and their end of tour date.